Vulture View, a Theodor Geisel Honor Book, American Library Association. I am so excited about this book! It explores the life of vultures, surely some of the most underappreciated cleaners in the world. It also teaches kids about warm air rising and cooling air sinking. Steve Jenkins has created gorgeous art for this book. The text is young, lyrical, with a push, pull, and refrain that kids will love. It works for surprisingly advanced audiences. Older kids seem to like the gritty facts of a vulture’s life. Personal note: I have had plenty of interactions with turkey vultures. When I was in high school I worked at Pete Conroy’s raptor rehabilitation center at Furman University in Greenville, SC. We took care of a young, rather clueless turkey vulture. I learned then just how shy and retiring these birds are in comparison with hawks and owls. I also learned how to gather roadkill. Yes, whenever I saw a dead opossum, I would pull my little blue King Cab to the side of the road and go pick up the carcass. This involved grabbing its long pinkish tail and swinging the thing into the back of the cab. This was dinner for the turkey vulture. When you are taking care of animals, you do whatever is necessary. Actually, it’s not a messy job, at all, thanks to that sturdy opossum tail. Jeff and I have also seen turkey vultures migrating through Panama. I will try to post some photos of those turkey vulture kettles another day. We saw them swirling by the hundreds and thousands. 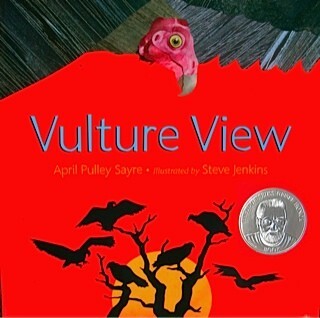 Now when I see turkey vultures I think of the words of the book. I think of the lovely illustrations by Steve Jenkins. Wait until you see the vulture faces! Why, they are positively attractive! It is amazing what art and some cut paper can do. Curriculum Standards can be found here.